Metagross's official artwork from Pokémon Ruby and Sapphire. Metagross (メタグロス, Metagross) is a fictional creature in the Pokémon franchise. Metagross is a Steel/Psychic-type Pokémon introduced in Generation III, and is categorized within the Pokédex at #376 as the "Iron Leg Pokémon". It evolves from Metang at level 45, which evolves from Beldum at level 20. All of them are very rare and hard to catch, and can only be found very late in any game they appear in. 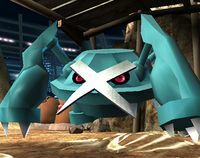 Metagross is the signature Pokémon of the Hoenn Champion Steven Stone, and it also gained a Mega Evolution in Pokémon Omega Ruby and Alpha Sapphire. Earthquake is a physical Ground-type move with 100 base power and 100% accuracy which hits all Pokémon adjacent to the user. Its good type coverage, high power with no drawbacks and wide availability make it a staple of many movesets. Metagross, like many other Pokémon, can learn it using TM26. Metagross appears in Super Smash Bros. Brawl as a Poké Ball Pokémon and uses Earthquake, which has effects similar to Venusaur's Frustration. When summoned, it slams its arms in the ground. Any opponent caught in the shockwave is buried in the ground and takes heavy damage. When it slams its claw while the opponent is buried or in mid-air, they will be sent upward. It struggles to grab the claw back out of the ground, before slamming another in. It repeats this several times before disappearing. The attack does not harm the user. Interestingly, Metagross is not recognized as an object as soon as it comes out. Because of this, It will fall through soft platforms when summoned on one. An Iron Leg Pokémon. When two Beldum combine, they evolve into a Metang. In the same way, a Metagross is the result of two Metang combining. It's said to have intelligence that can match a supercomputer. Though it weighs 1,212.5 pounds, it is somehow able to fold up its legs and float. Metagross as it appears in Super Smash Bros. for Wii U.
Metagross returns in Super Smash Bros. 4, keeping its Brawl mechanics. Metagross's trophy appears in both versions. In Super Smash Bros. for Wii U it is part of the Pokémon Ruby & Pokémon Sapphire Trophy Box. 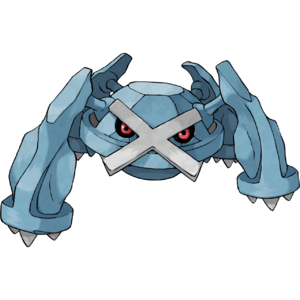 A hulking Steel/Psychic Pokémon, Metagross weighs in at around 1,212.5 lb. Even Snorlax isn't that heavy! It uses Earthquake by stomping its powerful legs on the ground, sending nearby fighters flying and burying those who come too close. You'll be safe in the air, so use careful timing to stay that way. A Steel- and Psychic-type Pokémon known as the Iron Leg Pokémon. At 550kg in weight, it's heavier than your average Snorlax. When its Earthquake hits, you'd better hope your far away (or at least in mid-air), because the tremors can launch anybody on the ground.. And watch out for its legs! They can stomp you right into the ground! Metagross returns as a Poké Ball summon. Metagross cannot be summoned on 3D Land, Arena Ferox, Golden Plains, Kongo Falls, Spirit Train, or Tomodachi Life. Metagross using Earthquake in Super Smash Bros. for Nintendo 3DS. Artwork of Metagross from Ultimate. If Metagross is summoned in a small space equivalent to the area of a normal sized block from stage builder, it doesn't move normally. Instead, it simply vibrates vertically. This page was last edited on April 18, 2019, at 01:20.